Established in 1906, Huntington Beach High School is a landmark in the city of Huntington Beach. Our bell tower is an iconic Main Street symbol, representing the pillar of academia we strive for each day at HBHS. Do not be fooled by our laid-back, beach atmosphere; Oilers put in work. Competitive spirit is strong-hold in the Oiler tradition. Student and faculty alike share the drive and desire to be the best we can be, to represent the orange and black with determination and pride. First and foremost, Oilers are here to learn. As a campus community, we strive to grow. The Oiler staff believes that student learning is not confined to subjects or classrooms, that we need to teach the whole student. We want our students to live full, happy, and healthy lives during their time on campus and when they leave our halls. As a result of increasing our focus on student wellness, Oilers are participating in growth activities such as focusing on communication skills, mindfulness activities, and time for reflection. Like oil rising in our iconic derrick, Oilers thrive as individuals. Together at HBHS, we rise. 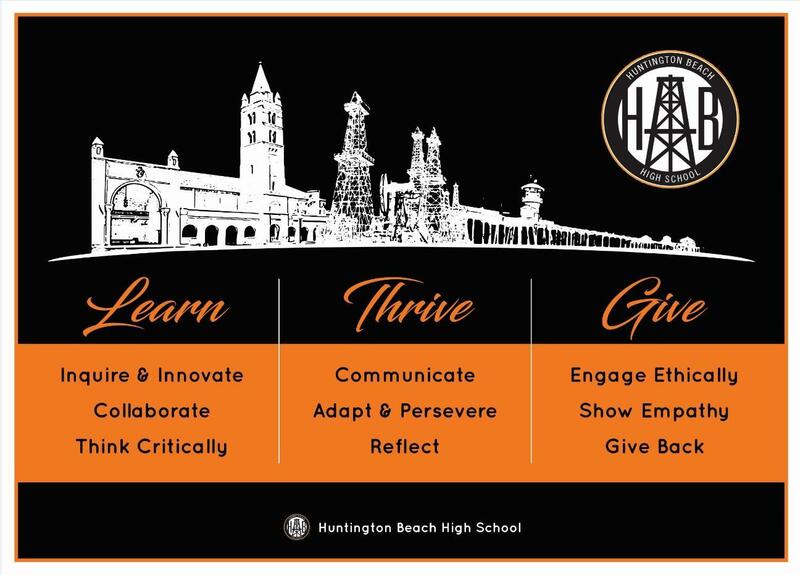 Huntington Beach is home to families of Oilers spanning multiple generations, and that innate tradition is something we are very proud of here at HBHS. In fact, a number of the teachers here on campus are former student Oilers. Because of our long-standing traditions, our surrounding community is important to us, and we are to them. Our community helps provide authentic, real-world learning opportunities as well as opens doors for our students after graduation. It is important that we, as Oilers, recognize this and find ways to contribute to the HB community, a community built on the planks of the iconic HB pier. Community connection and contribution is paramount to the success of our students. Oilers give back to our community.